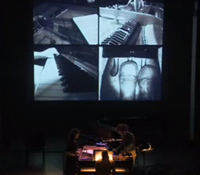 This concert with video and acoustic instruments by Ensemble Exchange, a UCSD-Harvard ensemble, is the seventh work in the 2014 season of IDEAS performances. This is the premiere concert of the Ensemble Exchange, a new, interdisciplinary UCSD-Harvard performance ensemble of musicians, writers and artists founded to nurture dialogue between the Music and Arts communities on the two campuses, with a general focus on the realization of works written within the last five years. For IMAGE|TEXT|MUSIC, the ensemble proposes a concert program representing recent works by UCSD and Harvard composers, and by Danish composer Simon Steen-Andersen. Composers and artists at UCSD and Harvard are increasingly engaged with developing technologies and artistic practices which have expanded the traditional performance spaces and sonic palettes of their artistic endeavors. Many recent works use computer-aided compositional practices, computer-processed and produced sounds, and digital video, in unique and novel ways. Ensemble Exchange seeks to reflect these emerging practices by performing works which require unique performance spaces and/or digital media, in addition to acoustic ensembles and instruments. The proposed program is planned to include two works that "make exceptional use of digital video and projection as an integral element of the acoustic musical performance," according to Jon Forshee, who co-directs the Ensemble Exchange with conductor Jonathan Hepfer. Jon Forshee composes music for acoustic instruments, computer-generated sound, and ensembles consisting of both. He is a Ph.D. student in Composition in the UC San Diego Department of Music. Avoiding any stylistic commitment, play and invention feature prominently in his music, while Forshee also remains a student of early Western music techniques and Far Eastern melodic ornamentation practices, with many of his works requiring unique performance spaces. Forshee enjoys collaborating with exciting video artists, choreographers, and writers, and his works, in all media, are performed throughout the United States and in Europe. He lives and works in New York. For more information, visit http://forshee.org. Jonathan Hepfer is a percussionist specializing in contemporary chamber and solo repertoire, and he is currently a doctoral student at UC San Diego. He began playing classical music at age 17 after discovering the music and philosophy of John Cage. Subsequently, Hepfer attended Oberlin Conservatory, UC San Diego and the Musikhochschule Freiburg (with the support of a two-year DAAD fellowship), where he studied with Michael Rosen, Steven Schick and Bernhard Wulff, respectively. At UC San Diego, Hepfer is a member of the UCSD graduate percussion ensemble Red Fish Blue Fish. Todd Moellenberg is a pianist currently pursuing his Doctor of Musical Arts in contemporary piano performance at UC San Diego, under Aleck Karis. He received his Master of Arts from UCSD, and his Bachelor of Music from the University of Texas at Austin. Todd has performed with the Palimpsest Ensemble, the University of Texas New Music Ensemble, the La Jolla Symphony, the What's Next? Ensemble, and as a summer fellow at Boston University and the New England Conservatory. Last year, Todd founded the performance art ensemble Family, which includes performers in both Visual Arts and Music at UCSD, generating performances with music, text, and movement. Nicolee Kuester is a French horn player and sound poet based in San Diego. As an instrumentalist, Kuester has performed internationally with the Ensemble Intercontemporain, the San Diego Symphony and Opera, the Lucerne Festival Academy, and the Orquesta de Baja California, and recently appeared as a soloist with the La Jolla Symphony. Her text works have been performed across the United States and Europe, and will be featured this spring as part of a collaborative installation at the Arts Festival of Northern Norway in Harstad, Norway. Kuester holds Bachelors degrees in music performance and creative writing from Oberlin College, and is currently pursuing her DMA in contemporary music performance at UC San Diego. Michael Matsuno is an emerging flutist, dedicated to performing contemporary repertoire and the music of our time. As a long-standing member of the Los Angeles-based What’s Next? Ensemble, he has championed the voices of many talented West Coast composers alongside standard works of the 20th century. His commitments throughout Southern California include frequent collaborations with the Ensemble WildUp, as well as notable past appearance on the Monday Evening Concert and Jacaranda New Music series. An avid orchestral performer, Michael has held the Principal Flute and Piccolo positions with the Young Musicians Foundation Debut Orchestra, and has attended the Round Top Festival Institute, and the Aspen Music Festival and School for orchestral studies. He has also been past Fellow with the Aspen Contemporary Ensemble. Michael received a B.M. from the University of Southern California, where he studied with Jim Walker, and is currently pursuing an M.A. in performance at UCSD with John Fonville. Batya MacAdam-Somer (b. 1983) grew up within the vibrant musical community of Houston, Texas, where she studied violin with Judy Offman and Fredell Lack. She began her college studies at the Moores School of Music, University of Houston and went on to earn a BA from the Manhattan School of Music in 2005 in the studio of Sylvia Rosenberg. Batya completed her MA at the University of California, San Diego in 2009. She has participated in the Lucerne Festival Academy, Aspen Summer Music Festival, International Festival Institute at Round Top and the Bach Festival of Leipzig, playing under conductors Pierre Boulez, Kurt Masur, Charles Dutoit, and David Robertson. Her involvement with composers and contemporary music has led to work across the country with organizations wasteLAnd, Glottalopticon, wild UP, Red Light, Foundation for Modern Music, TACTUS, and the New Music Collective. She is thrilled to be a member of the G Burns Jug Band and Quartet Nouveau. Batya recently completed her DMA at UCSD, working with János Négyesy.